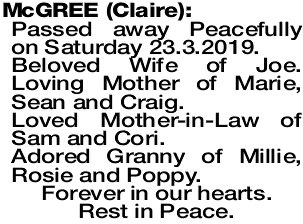 The Funeral Mass for Mrs Claire McGree of Kingsley formerly of Williams, will be celebrated in St Luke's Catholic Church Duffy Tce (cnr Whitfords Ave) Woodvale commencing at 10:00AM on S ATURDAY 30.03.2019). 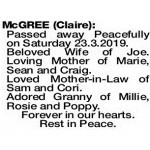 The cortege will leave the church at the conclusion of Mass and arrive at the main entrance of PINNAROO Valley Memorial Park, Whitfords Ave, Padbury at 11.30am for a Burial service. Passed away Peacefully on Saturday 23.3.2019. Beloved Wife of Joe. 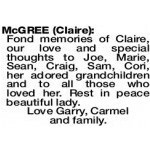 Loving Mother of Marie, Sean and Craig. Loved Mother-in-Law of Sam and Cori. Adored Granny of Millie, Rosie and Poppy. 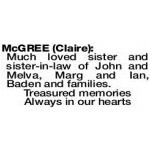 Much loved sister and sister-in-law of John and Melva, Marg and Ian, Baden and families. 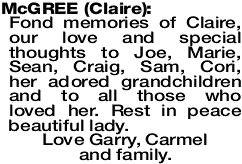 Fond memories of Claire, our love and special thoughts to Joe, Marie, Sean, Craig, Sam, Cori, her adored grandchildren and to all those who loved her. Rest in peace beautiful lady. Love Garry, Carmel and family. 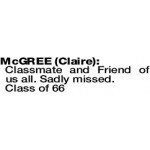 MCGREE CLAIRE Classmate and Friend of us all. Sadly missed.